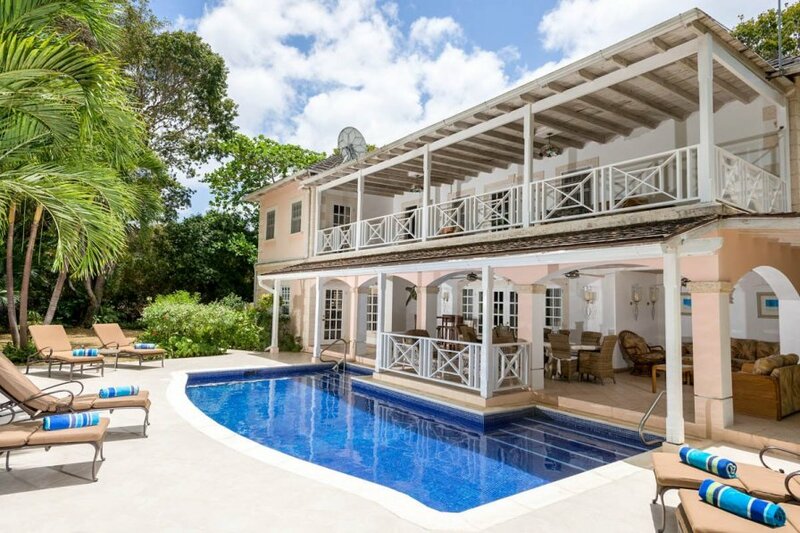 On the beautiful Sandy Lane Estate near Holetown, Sandalwood House is the perfect place to discover Barbados' glamorous Saint James district. On the beautiful Sandy Lane Estate near Holetown, Sandalwood House is the perfect place to discover Barbados' glamorous Saint James district. Sitting in more than one acre of landscaped grounds filled with many types of plants of palm trees, this villa enjoys verdant surroundings and easy access to the private Sandy Lane Beach, with use of a cabana and sun loungers included. Sandalwood House has a wonderful pool and terrace right outside, where you will find a gazebo offering a shaded seating area that's full of charm. In addition to the pool, there's a separate hot tub a few steps away, a lovely place to unwind at the end of a day's exploring. The open, covered terrace provides the ideal spot to enjoy dinner together or curl up with a book on the sofa, and it's super-comfortable and well furnished too. Inside, you have a large living area with satellite television, and a magnificently presented kitchen which has lots of space to gather around its central island, as well as direct access outside. Each of the four bedrooms in the main house is air-conditioned for extra comfort, and has its own en suite bathroom – you have three upstairs and one downstairs, along with another bathroom usefully located near the pool. In the grounds, you have a separate, self-contained cottage, offering not just another two en-suite bedrooms, but its own kitchen, living area and plunge pool by the patio. An experienced team of staff, including a butler, cook and housekeeper will be on hand to keep everything running smoothly, making a stay at Sandalwood House a truly relaxing experience. The villa is in an excellent location – not just close to the beach, but all of the entertainment and excitement of Holetown too. With unforgettable dining at the ocean's edge, high-end shopping and great nightlife, it's the place to be in stunning Saint James. Sandalwood House is a lovely 6-bedroom villa, with over an acre of landscaped gardens with more than a dozen different types of palm trees together with many other interesting and unique tropical flora and fauna.